One would consider Daniela Mauler well educated. She has studied in Germany, Austria and Belgium. She is a board-certified specialist in veterinary neurology and an assistant teaching professor in the Veterinary Health Center at MU’s College of Veterinary Medicine. Yet, her passion for improving the outcomes of her patients led her back to school. She decided to earn a Canine Rehabilitation Certificate. 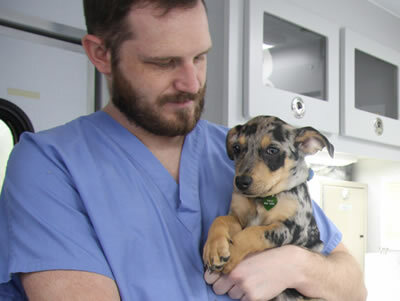 Until quite recently, the Canine Rehabilitation Certificate Program (CCRP) at the University of Tennessee, Knoxville, was the only university-based credential program for canine rehabilitation accepted by the Registry of Approved Continuing Education for veterinarians, veterinary technicians, physical therapists and other related professions. The curriculum consists of seven modules completed in order, including online curriculum, hands-on labs, elective courses, clinical practicum that includes an externship and case studies, and the certificate exam, which must be completed at the University of Tennessee. “I did some of the curriculum online, then went back to the University of Tennessee in July for the one-week course, and then took my exam there in December,” Mauler says. While the professionals benefit from the additional knowledge and an added credential, the ultimate beneficiaries are the end users — canine patients. “Since I came here, and I have this interest, we are giving our patients more rehab than they used to get,” Mauler says. “There are numerous studies now showing that even a specific group of dogs who are unable to feel their legs after back surgery, for example, benefit from rehab. So now, we start them earlier. I am really pushing toward getting everyone on the neurology service to do rehab on their patients. Rehabilitation on orthopedic patients sometimes occurs both before and after surgery. Adrienne Siddens, rehabilitation technician and co-coordinator with Gilliam of rehabilitation services and another CCRP graduate, likes to call it “prehab” when dogs receive rehab prior to surgery. The Neurology Service also works with the Nutrition Service on a program they call “Fat Camp,” where overweight dogs can get a good weight-loss diet and some good exercise. Mauler is a native of Cologne, Germany, who received a doctor of veterinary medicine in the country of her birth. She worked in private practice as a visiting veterinarian in New York and Berlin, and then completed a small animal rotating internship at the University of Vienna. 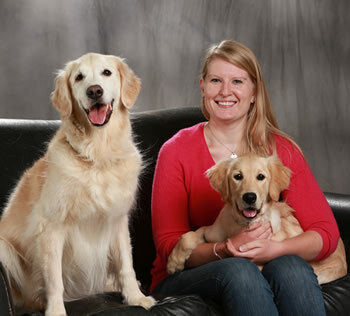 She passed the Educational Commission for Foreign Veterinary Graduates program to become eligible for licensure in the United States, and then completed a neurology residency at Ghent University in Belgium.